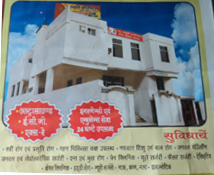 Jagriti Hospital & Research Center is a 50 bed multi-super specialty hospital located in the heart of Varanasi In a short span of 13 years, the hospital has earned the reputation of being one of the finest institutions in the health care sector backed by a team of doctors of national and international fame. The Hospital provides all medical facilities for any type of surgery ailment that a patient may face and the hospital's key areas of focus include joint replacement surgery, trauma, critical care medicine, eye-care, high risk obstetrics and birthing center. We are organize Free eye check up on 20/08/2014 at 10 AM . Frequently asked questtions for patients and visitors. Checkup's are a prerequisite to a happy and healthy life. World class consultations fpr disease prevention services. Information to help you and your family live a healthy life.